In case you missed it or were swept up in ‘Back to the Future Day’, Wednesday once marked Trafalgar Day in Nova Scotia. As part of our partnership with the new early Canadian history blog Borealia, we’ve reposted Keith Mercer’s recognition of the day and what it once meant. The Royal Canadian Navy recently named October 21 “Niobe Day,” in honour of HMCS Niobe, one of Canada’s first two warships. It was bought from the British in 1910, shortly after the Naval Service of Canada was established that spring, and served in the First World War before being seriously damaged in the Halifax Explosion in 1917. But for an older generation of Nova Scotians – and Canadians, growing up in a more British-centred school system and society – October 21 was once called “Trafalgar Day.” As children, they learned that on this day in 1805 a British fleet commanded by Lord Nelson in HMS Victory won the Battle of Trafalgar against the combined armadas of France and Spain. The most famous naval battle in history and the most decisive military engagement of the Napoleonic Wars, Trafalgar cemented Britain’s supremacy on the high seas. With the enemy decimated, Britons no longer worried about a French invasion. Of 33 enemy ships, the British captured or destroyed 18, while not losing any of their own. Unfortunately, Nelson, “Britannia’s God of War” and her most famous son and celebrity, died in the battle. He went out in the blaze of glory, during his crowning achievement. Known for his bold fighting style and leadership, Vice-Admiral Horatio Nelson rose to prominence during the Battle of Cape St. Vincent in 1797. 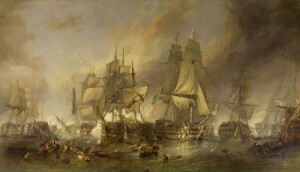 However, he is best known for three signature victories: the Battle of the Nile in 1798, in which he led the British in the destruction of a large French fleet off Egypt; the Battle of Copenhagen in 1801, which saw Nelson’s squadron capture or sink the bulk of the Danish navy; and Trafalgar in 1805. Like Britons everywhere, Nova Scotians followed Nelson’s career closely and celebrated his triumphs, particularly Trafalgar. This allowed them to express nationalistic sentiment and to show their support for the British war effort.